Overcooked is one of the best cooperative games I’ve played in some time. It’s a chaotic bundle of friendly shouting, laughs, and high-fives wrapped in a bundle that seems all too simple. But buried within all of that is a deeper understanding about what makes for a quality co-op experience. Each level of Overcooked tasks you with the same goal: prepare, cook, and serve as many dishes as you can within the time allotted. The faster you do this, the better the score you receive. Achieve a high enough score when time runs out, and you’ll earn three stars, which are accumulated and then used to unlock new levels. It’s a goal that sounds easy enough and it’s achieved via a process (i.e., cooking) with which we all have some form of familiarity; even if it’s just fixing a peanut butter and jelly sandwich. That process, though, becomes harder to do when you’re forced to run back and forth between two trucks that are moving at different speeds. No, that’s not a mistake, the concept of “food truck” takes on a new meaning in this title. The challenge of Overcooked comes not from what it asks you to do, but how to do it. Every stage is a unique opportunity to pit your cooking and task management abilities against a different environmental challenge. Maybe it will be working in a kitchen where there’s only enough room between the counters for one person to pass through. Maybe it will be trying to prepare fish and chips on two icebergs where the only way across is to catch a ride on a passing ice floe. It’s all carefully designed such that there’s a constant feeling of playing catch up. Everyone contributes equally in the Overcooked kitchen. Anyone can grab food, chop it up, toss it into a skillet/pot/fryer, and then plate it up and serve it when it's done. This equality means there's never one person who can possibly contribute more than another. There's a lot to do at any given moment, and all of it is always important. You can assign different roles to everyone ("you're the prep chef, I'll cover the fry station"), and you can do your best to come up with a strategy for how best to tackle a level (and you should), but a moment will inevitably come where something goes wrong. Your best laid plans go right out the window the instant someone forgets about that pot on the stove, and suddenly the whole kitchen is on fire. It's beautifully chaotic fun. Unfortunately, sometimes that moment is the result of the movement being a bit imprecise and that plate of food you meant to set down on a counter ends up in the trash. But even that occasional frustration is quickly overshadowed by the chaotic fun. You can face that chaos alone, of course, and there’s something to be said for the challenge that that presents. 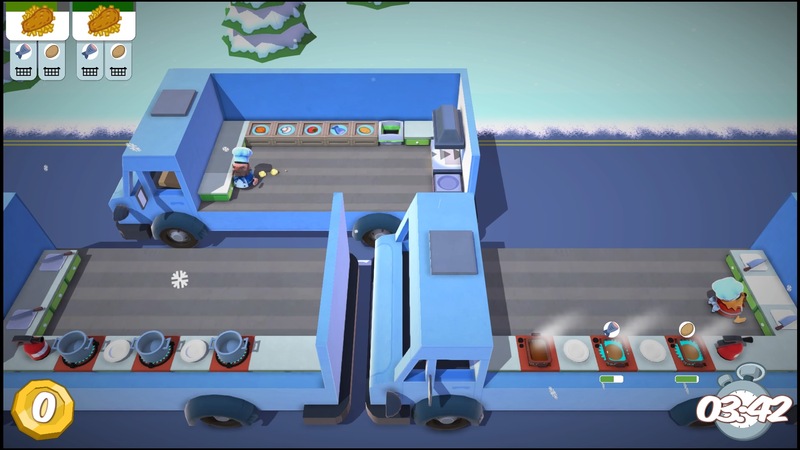 Rather than a group of people working together, single play in Overcooked becomes something more akin to a tag-team match. You control two cooks and swap between them to prepare the fete of the day. Getting three stars, in that case, becomes something of a personal achievement for which you strive and is satisfying, but it also feels wanting. 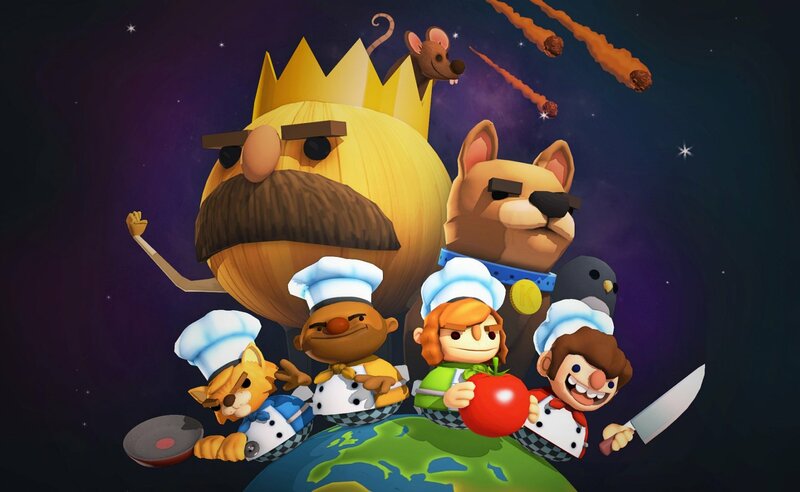 Aside from the occasional unforced error that comes from the controls, the single-player is the only other issue with Overcooked; not because it doesn’t work or isn’t fun in its own way, but rather due to that feeling that you’re missing out on something without another player there.